The new RF100 Speed from Guhring’s Ratio programme is the sharpest and quickest HPC milling cutter in the market. It features a 48° high helix and unequal cutting edge spacing for a smooth and quiet cutting operation. There are various options of the milling tool available. The long option possesses chip breakers in order to fracture short chips and ensures a friction-free chip evacuation. The RF100 Speed possess the appropriate geometry to do justice in materials such as tough, low and high alloyed steels, including materials that are difficult to machine, particularly in modern application techniques such as HPC milling strategies. The tool possesses an optimised face geometry: Large chip chambers on the face and improved web thinning allow process reliable plunging. Unequal cutting edge spacing ensures improved running smoothness and results in outstanding surface finishes and longer tool life. The optimised corner protection chamber and face correction protect the outer corner, the most susceptible part of the tool, on both sides, so the cutting edge withstands even heavy shear loads as well. This combination improves the tool life considerably. RF100 Speed has an oversized DIN shank for high stability. The reinforced core creates more chip room in the front area, making full slots up to 0.8xD possible without a problem. The optimiseed face also enables plunging in helical or oblique ramping. 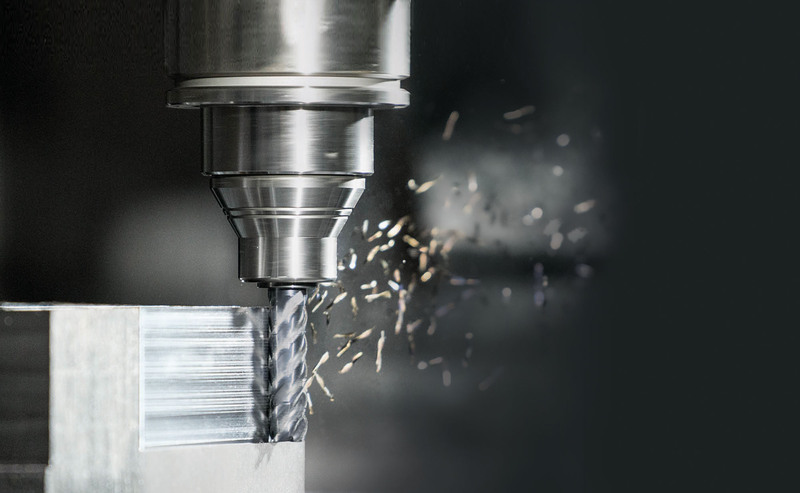 With previous face milling cutters applied in HPC stratgies, chips of the length of the feed are created. Subsequently, many chips are created in a short space of time that can only be removed from the process with difficulty. Chips remain on the workpiece and are evacuated with difficulty. Thanks to the chip breakers, the chips gather closer together, improving evacuation. Especially with internal contours and cavities, the chips can be evacuated better and therefore bring process reliability benefits. Machine loading is clearly reduced, while the volume output is increased, all thanks to the light-cutting operation. Tool life in excess of 278 min for roughing!